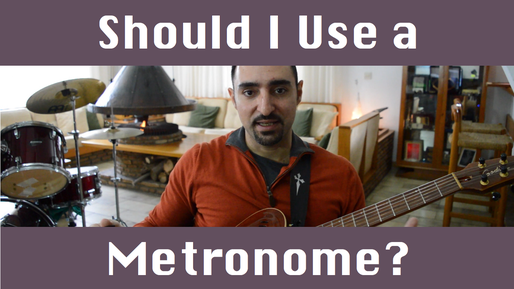 Should I use a Metronome? Some hate it, some swear by it. Join me as I share a few quick thoughts on the usefulness of one of the most ancient musical gadgets. "...so choose either legato or one or more of the picking strategies we will study in the next few lessons and get to work. And don’t hesitate to employ classical practice principles such as isolating problem parts, or using a metronome and gradually increasing speed and so on. These approaches, especially the use of the metronome, get a bad reputation sometimes, because if you just use them over wrong mechanics, you get no results. If you use a metronome and are not seeing steady progress, you should put it aside and examine your technique. But when you do get everything straight, then a metronome can be your best friend, because it can help you control your timing, it can show up problem areas, it can help you measure your progress and see where you need to push harder and more." Get the free "FRETBOARD MEMORIZATION TOOLBOX"